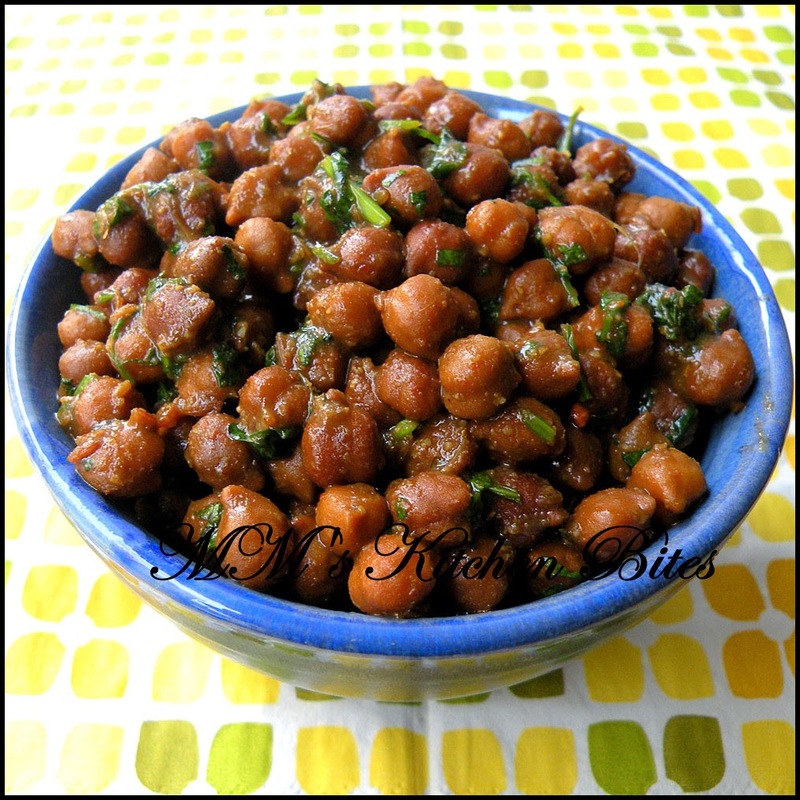 MM's Kitchen Bites: Masala Kala Chana...not just on a Saturday anymore!! Masala Kala Chana...not just on a Saturday anymore!! Like I had mentioned in one of my earlier posts, kala chanas used to be a regular Saturday lunch fare in our family. What hasn't changed till now is that kala chana curry is still a no no for me…but Masala Kala Chana has moved on from being just confined to a Saturday to become a regular weekday lunch with salad. Wash and soak the chanas overnight. The next day, discard the water the chanas were soaked in. Wash well and add four cups of fresh water. Cook the chanas with salt in a pan or pressure cooker till : a little mushy if you want to have it with roti/paranthas , cooked but still firm if you want to eat them on their own (which is how I like them). Heat oil in a pan, add cumin seeds. Once they start spluttering, add hing. Fry for about 2-3 seconds and add the chanas with the water they were boiled in. Add all the spice powders and ginger paste. Mix well, cover partially and let it cook on medium heat till all the water evaporates and chanas are left with only the spice coating and a barely there gravy. Mix in the fresh coriander, stir and serve. Thank you for posting this recipe. I was told to eat more of these and am looking for recipes. This sounds like a perfect match! This is a really healthy diet recipe, which my dietitian has also suggested, although i am not allowed any chapatis with it.Also like how you've said of sauteing it with onions and tomatoes, that's exactly how my mom makes it and it tastes really good. How many pressure cooker whistles shall one wait for?